Sometimes, you want to be transported to a different time, a different city, and reminded of the simple pleasure of things long past. With a diverse score by Leonard Bernstein, On the Town is a whimsical 24-hour journey of three sailors in New York City in 1944. Lyric Stage Company surprises with this rarely-done show. Spiro Veloudos is a masterful director, who creates a compelling story out of the mundane, raising the stakes and helping his actors achieve their fullest potential in each of their roles. 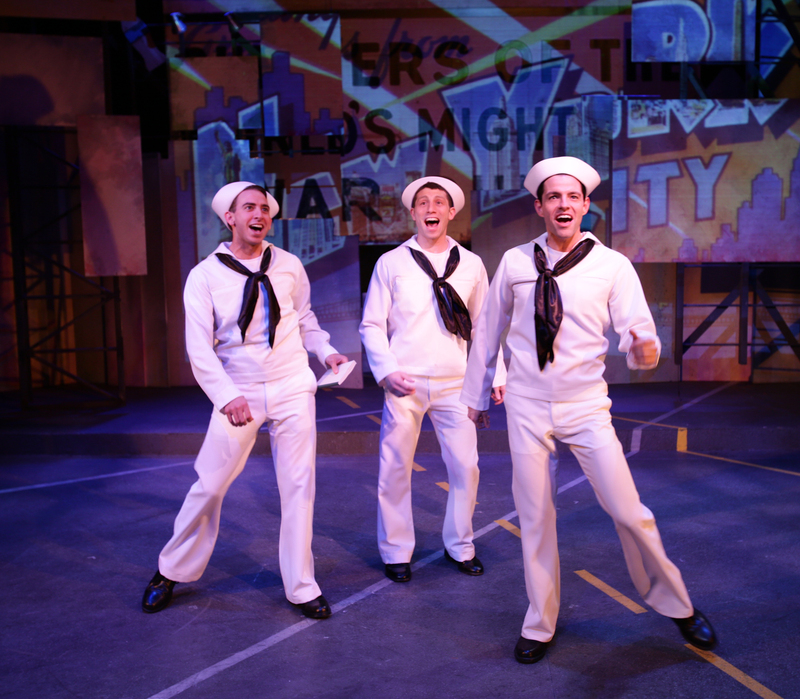 On the Town is the perfect and must-see show for a night on the town. The musical centers on three plucky sailors. These three sailors are anything but silly (jokes excepted), displaying some star-quality acting and singing. The strongest performance is delivered by John Ambrosino, playing the love-struck Gabey, with the soaring tenor voice reminiscent of days before auto-tuning and baritones stretching for their notes. Ambrosino is the real deal and each of his numbers makes one want to rise to their feet to applaud or hug him. Can we keep him in town for next season too?! Luckily, Ambrosino has the sensitive acting chops to match his talented voice. He impresses again and again, despite his lack of comedic material (no fault of his own). Phil Tayler also impresses as Chip, displaying the highest level of energy and comedic talent amongst the group. Tayler’s scenes with Michele A. DeLuca’s Hildy bring the house down, especially their “Come Up to My Place,” with one surprise after another. DeLuca and Tayler’s chemistry is the best amongst the couples, expertly crafted in each of their scenes but especially in “I Can Cook Too.” DeLuca is a stunning performer, never shying away from the brash and always delivering the perfect mix of enthusiasm and sympathy. Unfortunately, Zachary Eisenstat’s Ozzie and Aimee Doherty’s Claire miss the mark in their performances. Both actors boast impressive credentials and they never lack energy but, somehow, they fall flat. Their moments always feel contrived and characterized rather than fully realized. Unlike their other leading co-stars, Eisenstat and Doherty’s relationship never feels real. Maybe it’s not meant to last more than the evening, but I never felt the stakes were worth the trouble of overcoming Claire’s “understanding” fiancé, Pitkin, played with consistent vibrato by J.T. Turner. The cameo roles played by the impressive ensemble all shine in their moments, especially some of the featured dancers. The ensemble understands their role to create a true night of performance and spectacle, never laboring a joke or a moment beyond its purpose. Because of this expert directing and skillful performing, Veloudos’s production moves at a steady pace. Act I seems slightly disjointed from the hectic, even frantic pace of Act II, but I blame the book writers. In someone’s spare time, On the Town’s book needs a major overhaul to try to balance the two acts and remove some superfluous moments. Regardless, the production is a solid night of quality theater, impressing in all of the right moments. I would be remiss without mentioning Kathleen Doyle’s (hopefully) award-winning costumes, Janie Howland’s creative use of the intimate Lyric Stage Company’s stage, and Scott Clyve’s consistently brilliant use of lighting to aid the production’s storytelling. The true talent comes from Ilyse Robbin’s artful choreography and musical staging. She moves the story forward through movement and dancing, crafting the choreography to suit both character and actor alike. On the Town is truly a dance musical, with singing and acting taking a backseat in this whirlwind performance. However, Robbins and her talented cast rise to the challenge, creating a truly awesome night of theatre and spectacle. While On the Town rarely dazzles with thoughtful or deep storylines and characters, the production dances its way into our hearts with its sincerity and talent.